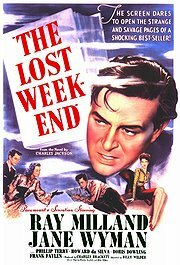 The Lost Weekend (1945): Dir. Billy Wilder. Written by: Billy Wilder and Charles Brackett. Based upon the novel of the same name by Charles R. Jackson. Starring: Ray Milland, Jane Wyman, Phillip Terry, Howard Da Silva, and Doris Dowling. Unrated. Running time: 101 minutes. Having just collaborated with author and alcoholic Raymond Chandler on Double Indemnity, director Billy Wilder began work on a film that would expose the dangers of alcoholism once and for all. The finished product tells the story of a promising writer named Don Birnam, who drinks to escape his self-doubt (but not to increase literary output). His brother and girlfriend do their best to help him kick the habit, but will the allure of the bottle be too great? The film’s best moments exhibit the psychology of addiction through wry humor and potent imagery. Contriving artifice after artifice, Don struggles to placate his ravenous addiction through the cleverest of means. But Don isn’t so much a bad guy as a man with a terrible problem, and actor Ray Milland does fine work showing us the more pleasant sides of his character. Unfortunately, for a film that deals with the seriousness of alcoholism, it has an overly simplistic touch. The film seems treats Don’s problem more as a public service announcement than as an objective look at addiction. It goes out of its way to explain Don’s problem and the subsequent solution. I only wish it were so easy for actual alcoholics. Wilder’s film also lacks a certain level of gritty realism necessitated by the subject matter. The score employs a theremin (creating strange wailing noises), which rather than underscore Don’s paranoia, instead made me wonder if a UFO was about to land. And one scene, in which Don hallucinates a bat flying into his apartment and devouring a mouse, takes the flick to new levels of silliness. Still, Wilder does create some effective set-pieces showcasing the survivalist tendencies of a desperate man. I don’t think this is essential viewing (even for alcoholics), but it’s a strange sort of mixed bag.